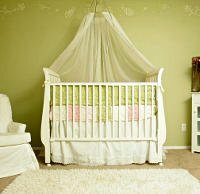 Everything in the baby’s room – from the mattress to the paint on the walls – can emit harmful volatile organic chemicals (VOC) that can cause breathing problems. Lung disease and breathing problems are the No. 1 cause of death in infants less than 1 year old, according to the American Lung Association. – Use only eco-friendly paints such as Benjamin Moore’s Eco Spec, Sherwin Williams’ HealthSpec or ICI Dulux Paints Lifemaster 2000. – Avoid vinyl wallpaper, which can trap moisture and help mold grow. The plasticizers in the vinyl emit VOCs. Her choice of paper for the nursery was Venetian Carnival, a handprinted wallpaper from Scalamandre featuring a playful motif of monkeys, goats and masked men and women. – Furnish the room with recycled solid wood furniture and repaint it. Avoid the “disposable” stuff made with particleboard, which emits VOCs. Cornices also should be made of solid wood. – Be careful when selecting a mattress. Some may contain vinyl. She recommends a mattress from E.J. Schrader Mattress Co. that is lined with rubber foam and insulated with naturally flame-retardant wool. – Use natural fabrics. She covered the loveseat in 100 percent cotton and says it’s a good idea to use washable, removable slipcovers. – Look for sofas and loveseats that are eight-way hand-tied. This ensures quality construction and means the frame is wood. Particleboard cannot support the weight of eight-way-hand-tied construction. – Replace closet doors with louvered versions that allow air to circulate and prevent moisture and mold from accumulating. – Wood floors are best. If you use area rugs, make sure they are 100 percent cotton with no synthetic dyes. – Do not use an air machine with an ionizer or ozone. Upton recommends the IQAir machine with HEPA filter. – Put nothing above the crib that could fall into it. No shelves. No pieces of art. – Do not place the crib near a window. The baby could stand up and fall out. – Look for cordless blinds such as Hunter Douglas’ LiteRise. – A Baby’s Breath, a free booklet from the Florida American Lung Association; call (561) 659-7644 or download a copy at www.lungfla.org. – E.J. Schrader Mattress Co., manufacturers of eco-safe mattresses in West Palm Beach, Fla., has a Web site, www.schraderbeds.com.